A compression fracture is a break in the vertebral body of the bone often due to the loss of bony calcium that occurs in osteoporosis. 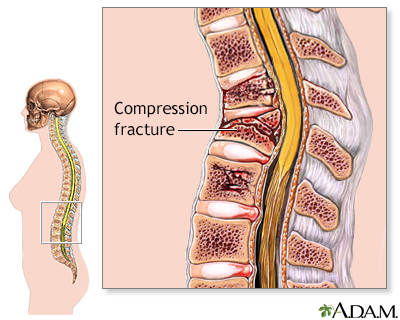 As the bones of the vertebral column and back weaken and become thin, very little force is needed to cause a compression fracture. These breaks can be painful and depending upon the severity they can require a range of treatment from pain relievers and home care to surgery.